On this New Year’s Day of Fruit Trees it is fitting to celebrate the two stately trees that changed the course of history: The Tree of Life and the Tree of Knowledge (that is also dubbed the Tree of Death since it did, allegedly, bring death into the world). 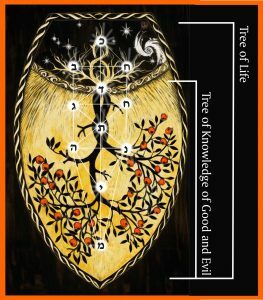 Kabbala identifies the Tree of Life with the ten sefirot that together form an upside tree with roots above (keter, chokma, bina, daat) and fruits below (malchut). The Tree of Knowledge portion of that mystical tree extends from the ground to the fruits—encompassing the trunk, branches, leaves and fruit—in other words everything but its roots. In sefirotic terms, the Tree of Knowledge spans from malchut up to and including the lower half of the sefira of daat. This portion of the sefirotic tree is called the middot, the emotional attributes, as opposed to the upper three sefirot which represent the mochin, or brains. To eat from the Tree of Life is to stay present with the Presence, to bring the devekut of gratitude into every instant of enjoyment. To eat from the Tree of Knowledge is to partake of life’s pleasures without acknowledging the hidden source of that bounty—without using that moment of pleasure-taking as an opportunity to commune with the Primal Will to Good, the Source of those delights. When we take from the world without acknowledging the Holy One—without considering the heavenly roots of this worldly benefit—we eat from the Tree of Knowledge. These two trees, then, are really just two ways of enjoying our harvest. Their fruits are the same, yet the consciousness that’s held while eating them makes all the difference in the world. With this as our starting point, let’s revisit the Genesis tale, but from an angle that’s not oft explored. As history evolves and the moonlike Shekhina waxes in stature, she acquires a voice and shares her side of the story through the scholarship of those who stand in her shoes and serve as her mouthpiece. The human psyche mirrors these two archetypal trees: Our Divine Soul orients toward the Tree of Life while our earthy Vital (Animal) Soul resonates with the Tree of Knowledge. The Divine Soul serves G‑d through self-nullification. At any moment it is willing to die for truth—to sacrifice its will on the altar of Divine service. The Vital Soul has a more complicated mission. It’s our survival instinct. Its job is to preserve life at all costs and that is its expertise. It heals wounds, knits bones, grows teeth, vomits poison, and on the psychological level it punishes insult, wins approval, pursues pleasure, etc. Since HaShem is called the “Life of all worlds,”—its preservation of life is equally a holy duty. Clearly, these two souls have very different agendas. Yet both are critical to our raison d’etre. HaShem, before creation, by definition, was lacking nothing except, in some mysterious sense, the experience of actualized relationship because there was no other with whom to relate. HaShem created creation, i.e. us, to enable all the myriad faceted possibilities of relationship, some of which have already happened and some of which, the more consummate levels of which, have yet to be realized. Every relationship has a paradox at its core, for soulmates are both one and two at the same time. They are one because they are actually two halves of a single entity, a single Adam. The pleasure of their union (says kabbala) is the joy of becoming more whole. Uniting with their “other half” they become more fully and utterly themselves. And they are two because a relationship, by definition, is an association of two or more things. If these two would ever permanently merge there would be no more relationship and no more pleasure of reuniting. The only way to cover both of these bases is to dance back and forth between them in a pulse of merging and differentiating. The Divine Soul presses for merger. “Eat from the Tree of Life,” it urges—dissolve into the One. The Vital Soul yanks us back to our senses (literally). It summons us to differentiate by asserting rather than sacrificing will. It eats from the Tree of Knowledge—rightly called the Tree of Willfulness (says R. Bachaya) because it strengthens self and emboldens will. Adam and Chava assessed the situation and chose life by (paradoxically) eating from the Tree of Knowledge (aka, the Tree of Death). They were the most enlightened beings that ever lived. How could they make such a huge (and seemingly obvious) mistake? R. Bachaya says they genuinely deemed the Tree of Knowledge as more essential than the Tree of Life and believed they were choosing the high road. Kabbala explains that their test was very subtle. They were challenged to discern between good and very good. Bad was not even in the picture. Their question was: What’s the priority of this moment—merging or differentiating? From the Vital Soul’s perspective, the Tree of Life was really the Tree of Death. Its call for total surrender was a recipe for self-annihilation (or so it seemed). To merge now, before they had really lived, would be regression, not consummation. The Tree of Knowledge appealed to the Vital Soul’s survival instinct. It promised delectable sustenance, beauty (the ultimate of which is truth), and ever-expanding consciousness (the root of all pleasure according to kabbala). These were the tools they needed to fulfill their mission as cosmic other—to strengthen their selfhood so that even in merger they would not fully cease. From this perspective, the Tree of Knowledge was clearly the path of life. On the other hand, HaShem commanded them NOT to eat from the Tree of Knowledge under penalty of death. Yet, says the Ari, for some mysterious reason HaShem also made it impossible for them to obey that command. Why? Perhaps because the relationship HaShem sought was not with a puppet but with a full-fledged other. HaShem gave Adam and Chava the opportunity to cut their umbilical cord by issuing a command and secretly compelling them to disobey it. In that way Adam and Chava asserted their autonomy. They assessed the situation and chose to differentiate—for heaven’s sake—to enable God’s purpose to succeed. This was Chava’s initiative and she has been hounded for it through history, yet, in fact, she probably saved the day. The ultimate fulfillment of relationship (says the Ari) is when he and she meet from the crown of their heads to the soles of their feet—when every point of one is met and matched by the other. (This applies between individuals, within individuals, as well as between us and HaShem). When the masculine archetype preponderates, and is not tempered by a sufficient counterbalance of feminine sensibility (says the Leshem) then inertia rules. His holy strivings (which start out good) will unfold indefinitely, beyond their point of diminishing returns, because he cannot bring himself to assert a boundary—to press the brakes and slow the pace—when it comes to avodat HaShem. This is true even when a change of tack is crucial, for other Torah values are withering from neglect. 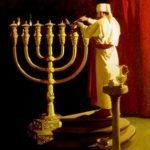 When focus freezes on a single mitzvah we betray our Talmudic legacy and the complex weave of perspectives that is its hallmark. It is time for the emergency measures that were instituted, post-holocaust, to recover faith and rejuvenate scholarship, to be evaluated in this light. There comes a time when you must step back in order to take your next forward step. 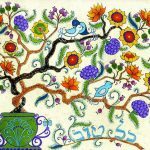 Let us internalize the lessons (עצות) of those two cosmic trees (עצים) that occupied the garden’s center, shared the same roots, but tugged in opposite directions. Help us to find our own center that integrates the contrary pulls of our soul, possesses the wisdom of pace, and steers us toward redemption. “May the voice of the groom and the voice of the bride” both be welcomed and considered as we navigate through these confusing times. Rabaynu Bachya on the Torah, Gen. 2:9. R. Tsadok HaKohen, Pri Tsadik, Gen. 8; Tu B’Shavat 2. See Eating as Tikun (1996) by Sarah Yehudit Schneider. R. Shneur Zalman of Liadi, Tefilat Lekho HaShana, pp. 138-139; Sarah Schneider, Kabbalistic Writings on the Nature of Masculine and Feminine (3rd edition, Still Small Voice Publishing). R. Shalom Elyashuv (Leshem), HaDrush Olam HaTohu Sec. I, p.149 left col; R.M.R Luria, Bet Ganzai, Parshat Vayerah p. תכא – תכב. Beit yakov, hagada p.25 (ועבדך). 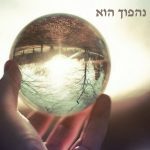 Ari, Likutei Torah, Bereshit, the passage that begins:והנחש היה ערום. Because tsaddikim are so committed to truth, when they speak words, believing them to be true, but in fact, they are not, HaShem providentially adapts reality to make their words true. How much more so for HaShem Himself. Thus, notes the Ari, HaShem said “On the day you eat from it, you will surely die.” He didn’t say, “if you eat from it” rather “on the day…” Ari explains that when HaShem spoke those words it was inevitable that the day would come, when those words would be proven true. Ari, Eitz Chayim, Heichal Nukba, Shaar Miyut HaYareach, Chapt. 1. Leshem, HDOH, chelek 1, drush 1, siman 2,3. Inertia is the tendency of an object that is stationary to remain stationary, or when in motion to continue in motion indefinitely.